Today I will show you the installation and configuration of Zerto Virtual Replication 2.0 (ZVR) product for VMware vSphere. Zerto as a specialist in the matter has released already second release of their replication product. Zerto Virtual Replication is a product destined for enterprises which do need to protect VMs and applications. Protecting VMs by replicating to remote site over a WAN connection, or to the cloud. Zerto VR 2.0 can also replicate VMs or group of VMs to the cloud (or from the cloud) when paired with vCloud Director. In fact Zerto partners with 33 Cloud providers to provide Cloud Disaster Recovery (DR) services. 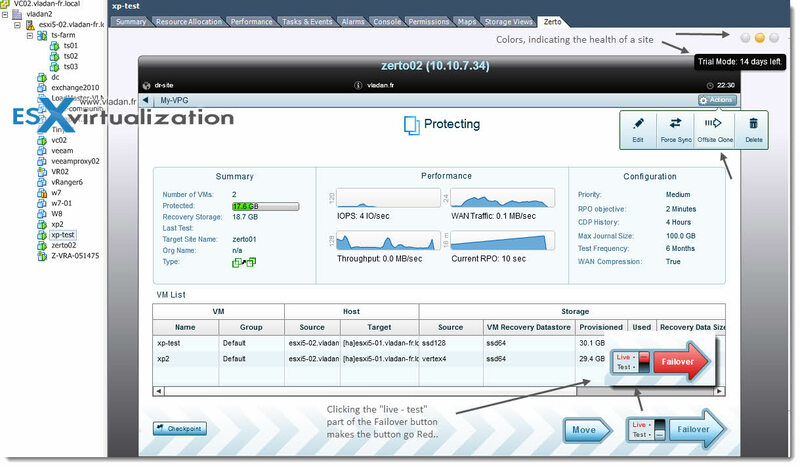 All the cloud partners do have a Zerto Virtual Replication 2.0 (ZVR) running in their environments. Even if your company doesn't have your own DR site, you can still opt for DR services with one of the Zerto's partners. On the other hand, Zerto can be used in more modest environments with vSphere Essentials Package – a vSphere bundle destined for SMB market. vSphere Essentials, which can handle up to 3 physical (2 CPU sockets each) hosts with bundled vCenter Server for central management. So we can imagine having DR site just with one ESXi server with local storage, one vCenter server VM and Zerto as DR solution. This simple and low cost option can obviously be upgraded later on when the necessity to protect more VMs will occur. But Zerto can manage more sites than 2. You there one to many OR many to one scenarios possible as well, especially when paired with vCD….-:) and there are some other cool options like masking IP addresses of the ESXi hosts from being seen by the remote customers which replicate to a central datacenter, but this is outside of the scope of this review. – VMware vCenter Server v 4.x and higher with at least one ESX/ESXi host (ESX/ESXi 4.0 is supported) with 4 Gb of free RAM. – A Windows 2003SP2 VM or higher, for Zerto Virtual Replication to be installed. (can be 2008 or 2008R2 too). – NTP clock synchronization between those two servers and .NET version 4.0 (included with the Zerto installer). – Firewall Ports 9080 and 9081 (can be changed during installation). The NAT firewalls aren't supported. Installation of Zerto VR 2.0 components. Zerto Virtual Manager – This Zerto component gets installed on separate 2008R1 Windows VM. It's recommended to have a VM with 2 vCPU and at least 4gigs of RAM. A Zerto virtual replication appliance (VRA) is deployed after the ZVM installation. This VM handles the traffic in an out of your datacenter. The VRA replicates continuously the data from VMs that user selects for the replication. The data can be compressed before hitting the WAN using Zerto's built in compressin. The VRA is “sitting” at the lower layer than the VMDK layer, it does not use hypervizor's snapshots like some products do, but offers true continuous replication, with no impact on the application's performance. My simple test lab architecture. 2 ESXi 5.1 hosts running vSphere 5.1 (ESXi5-01.vladan-fr.local and ESXi5-02.vladan-fr.local). Each of the ESXi hosts is managed by separate vCenter. I prepared two 2008R2SP1 VMs for the Zerto installation. On each host, there is one VM. (zerto01 and zerto02). I have created forward and reverse DNS records for the two Zerto VMs, and assigned them a static IP address (recommended). Other two IP addresses had to be created for the Zerto Virtual appliances. In the installation package, there is a .NET 4.0 included, which is one of the prerequisites. You'll need the credentials to connect to the vCenter Server and ESXi hosts. The Zerto Virtual Manager (ZVM) installer validates those prerequisites and shows you a recap screen, then you'll be able (or not) continue with the setup. Zerto ZVM installer installs a windows service on the ZVM VM, and also adds new tab in your vSphere client. You might need to close and reopen your vSphere client to see the new tab appear. There is a Zerto Virtual Manager Windows service, which get's installed on the Zerto Virtual Manager Windows VM. The ZVM can also be installed on the same VM as vCenter, but Zerto recommends to install Zerto Virtual Manager on a dedicated virtual machine with enough resources, protected by HA, if possible. The VMs where ZVM is installed should also get it's clock synchronized with each other using NTP. The best is to synchronize with external NTP pool service. The image bellow shows the available plugins in my vSphere client. And here is the screenshot from the vSphere Client, where new tab has appeared. Once you enter the license, you can deploy the Zerto Virtual Replication (ZVR) appliance. You can't miss the big Install button there. Can't be simpler. Note that I did not have to enter the license on both sites, but after entering the first site, the second one got paired automatically. (I have only 2 sites). But I had to deploy the VRA on both ESXi hosts. Zerto recommends to deploy one VRA per ESXi host, so if you're managing whole cluster, then you should be deploying the Zerto VRA on each of those ESXi hosts inside of your cluster. Click to enlarge. Then, you can see the deployment of the ZVR appliance starts the deployment process. Here is a screenshot showing the GUI of Zerto, the progress bar, and also the vSphere client's task bar, where you can see the process to continue the deployment. So to start protecting VMs in your infrastructure, you have several options. Basically what you need to do is to create a what they call Virtual Protection Group (VPG). You can create a virtual protection group to protect single VM, where the VM will be protected as a Standalone VM. Or you can create protection group which protect a bunch of different VMs from your site, and Each of this group is different. You can have VMs which are located on different ESXi hosts, on different datastores (or DAS), VMs having multiple VMDK disks attached, but you can all add those VMs together to manage them as a single VPG. Imagine you have a database which has two or three front end VMs, and all this needs to be tighten together, because if not, the application as a whole just won't work. That's what the VPG is designed for. Option 1. you select the VM which you want to replicate, and click the Zerto Tab. 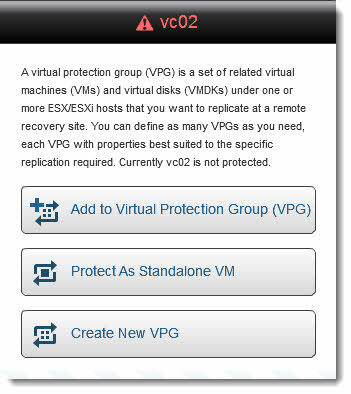 Then you have a choice of creating the Standalone protected VM or Group of protected VMs. Option 2. You select your cluster (or Datacenter) > Zerto Tab > New VPG. In the window which will appear, you have the possibility to add the VMs you need. Please note that you must select the cluster or datacenter. If you select just a single host, then the Zerto tab just doesn't appear. So If you have a DR site just with one ESXi host, you still have to create a datacenter and then add an ESXi host, when creating the site's Virtual structure through vSphere Client. If you add more VMs to your VPG, you can manage startup order in case of failover. You can see it on the image below, the button is grayed out when I'm selecting the VMs which will take part of the VRG. When adding a vApp (yes zerto can protect vApps), the starting order is not managed through Zerto, but through the vApps properties. (you have window which pops up in case you want to override the startup order). While my VM was finishing the initial replication from one side to another, I was playing a bit through the UI. The UI is very responsive, with animations, all made in Flash. Great piece of software, which gives the impression of stability and robustness. Once the initial replication done, you have the possibility to test a failover or proceed to manual failover. There is a big directional button at the bottom of the screen, which enables you to test the failover. Note few things through the UI. There is a clickable area which makes the big Failover button go Red, it means what you think it does – a Failover. At the top there are a color indicators that shows the overall health of the site. In my case it's orange because I'm using 14 days trial license. Note also the Off Site Cloning possibility. What for? Hey, it's kind of a backup, or archiving for a VMs. Hmm? Interesting isn't it. DR solution with offsite backups stored …. offsite. 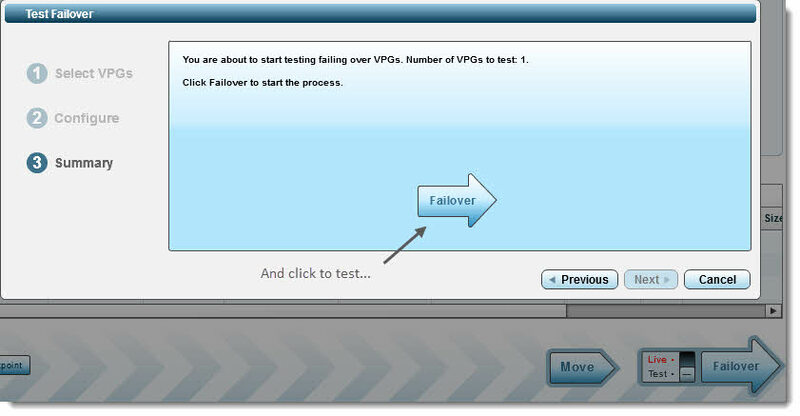 So the next screen after we click to do the test failover, you can see the slider which gives you the option to choose the point in time which you want to recover your VM. The default option selected is – latest. 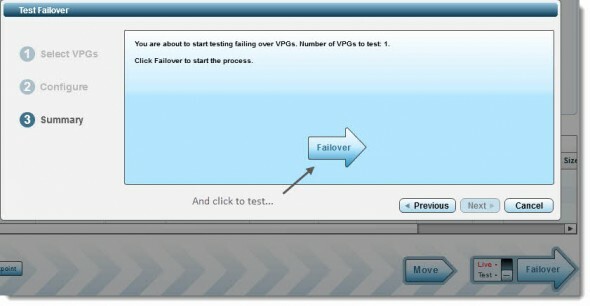 And by clicking the big failover direction, you test for a failover. And from there the button which has for now was just normal color, is now fully Red inviting me to hit to fail over to the other site. And I can see on the recovery site, those VMs which are present inside of the protected group, are now created and up and running. There is also a possibility to stop the test and not to fail over, of course. I could have test other options and show you other configurations, but I think that you get quite a clear picture of the product's possibilities, the look and feel of the UI and the quality of the overall application. Through a single article it's just impossible to talk about every single option, or configuration setting. I'll certainly come back to this product later, to show you some advanced possibilities and tweaks which makes Zerto stand out of the crowd. As I had briefly the occasion to test the free VMware vSphere Replication, the Zerto Replication is much more advanced, has more options which are really useful when planning for DR scenarios. Zerto has been awarded Best of Show and Gold Award at VMworld. Note: Please note that this review was sponsored by Zerto. I see this question has been asked in some other forums – Since VmWare is not publically supporting any kernel filters at vSCSI/VMFS layer, how zerto is inserting their modules into ESX kernel? Are they using non-supported mechanisms to intercept write IOs? Even though this is an anonymous post, I’ll answer the question. We do not use any non-supported mechanisms for the Zerto solution. There are many ways to get the I/O information via published APIs. That, in combination with our appliances allows us to deliver very low RTOs and RPOs. What is the advantage of Zerto compared to the feature “Vsphere Replication” directly embedded in Vmware ? And what about pricing for this solution ? Full disclosure: I am a Zerto employee.